1 1. Distinguish between the draft horse and the light horse. 3 3. List four physical characteristics of the mule. 4 4. Identify a burro from a picture or live. Give its size, color, and usefulness. 5 5. Identify from pictures or live animals four kinds of milk cattle and four kinds of beef cattle. 6 6. Know the milk-producing qualities of the Jersey, Guernsey, and Holstein breeds. 7 7. What is the difference between the Angora and milch goats? Give the distinguishing colors of at least three different breeds of goats, such as Saanen, Toggenburg, Nubian, and British Alpine. 8 8. Identify from pictures or live sheep and note wool and meat production, size, markings, and general appearance of three breeds of sheep, such as Merino, Rambouillet, Shropshire, Hampshire, and Lincoln. The Livestock Honor is an optional component of the Zoology Master Award (available only in the South Pacific Division) . 1. Distinguish between the draft horse and the light horse. Draft horses are recognizable by their tall stature and extremely muscular build. In general, they tend to have a more upright shoulder, producing more upright movement and conformation that is well-suited for pulling. They tend to have short backs with very powerful hindquarters, again best suited for the purpose of pulling. Additionally, the draft breeds usually have heavy bone, and a good deal of feathering on their lower legs. Many have a straight profile or "Roman nose" (a convex profile). Draft breeds range from approximately 16 hands high to 19hh and from 1,400 to 2,000 lbs. Light riding horses such as Arabians, Morgans, or Quarter Horses usually range in height from 14.0 (142 cm) to 16.0 hands (163 cm) and can weigh from 386 kilograms to about 540 kg (850 to 1200 lb). Larger riding horses such as Thoroughbreds, American Saddlebreds or Warmbloods usually start at about 15.2 hands (157 cm) and often are as tall as 17 hands (172 cm), weighing from 500 kg to 680 kg (1100 lb to 1500 lb). Description: The Percheron is a breed of powerful rugged draft horses that originated in the Perche valley in northern France. Percherons are noted for heavy muscling and for an aspect of ruggedness and power. Also characteristic of the Percheron is clean action and quality conformation of the feet and legs. The mane is thick, though the tail is usually cut short. The breed is close coupled, wide and deep through the chest, with plenty of back rib. The muscles of the forearms, croup and gaskins are especially emphasized in a good drafter, and ease and balance of gait is essential. The horse is also expected to be of good temperament and be an easy keeper. The Percheron head and neck is typical of the correct draft horse. Good Percherons have a large and full prominent eye, a broad and full forehead, and straight face. A wide jaw and refined ears attractively set and carried with animation are visible evidence of the Percheron's Arabian ancestry. The Percheron has a very pleasing disposition, and is proud, alert, and intelligent. They are generally very gentle horses, well-suited for driving, and are strong and willing workers. They have the strength to pull heavy loads and the graceful style to pull a fine carriage. Percherons can be ridden and some have even been trained to jump. Percherons range in height from 15 to 19 hands high, most are between 16-2 and 17-3 hands high. They can weigh up to 2,600 pounds with the average around 1,900. Percherons are generally black or gray. Description: The Belgian has a small head, thick and muscular neck, powerful shoulders and quarters, short legs with small amount of feathering. Chestnut or red roan in color, they can stand up to 17 hh (1.7 m). On average the Belgian will grow to be slightly over 1 ton or 2,000 pounds. Colors normally are a type of light chestnut with a flaxen mane. They are considered a draft horse. Historically their main use was as a farm horse. They are still used as working animals, but have also become popular as show horses, gaming horses, and even as trail riding horses. They are able to pull tremendous amounts of weight. At the National Western Stock Show in Denver, Colorado, a team of two horses in the Heavyweight class pulled 17,000 pounds a distance of 7 ft 2 in (7,700 kg a distance of 2.18 m). The team of Belgians weighed 4,800 pounds (2,200 kg). Description: The Clydesdale is a breed of draft horse derived from the very hard-working farm horses of Clydesdale, Scotland, and named for that region. Thought to be over 300 years old, the breed was extensively used for pulling heavy loads in rural, industrial and urban settings, their common use extending into the 1960s when they were a still a familiar sight pulling the carts of milk and vegetable vendors. Clydesdales are noted for grace and versatility; they can stand as tall as 18 hands (1.8 meters or 6 feet) in height and up to one ton (2,000 pounds) in weight. A Clydesdale has a large head with somewhat convex profile, small ears, large, dark eyes and a heavy forelock. The neck is short and slightly arched, the chest deep, the shoulders heavy and well-muscled. The back is short, the withers clearly defined, and the rump presents a well-muscled and distinctively rounded silhouette. The legs should be long and strong with characteristically large hoof size, being at least twice the diameter of those of a light riding horse, such as a Thoroughbred. Clydesdales may be of several possible colors, including various shades of bay (sometimes called brown), roan]], chestnut, and black. The Clydesdale horse species have characteristic long hair, known as feather (not "feathers"), on the lower legs, falling over the hooves. Generally white, the feather can occasionally be black or chestnut, depending on the color of the horse and the presence of markings. Nowadays chiefly for show, this hair was first a result of native stock and breeding with Flemish horses. Clydesdales have a range of characteristic white markings which are generally present regardless of body color. The most distinctive are four white feet and a blaze, most often a full blaze or large, white "bald face" marking which extends to the lips and chin and may also extend to the eye region. Description: The Arabian horse is a breed of horse with a reputation for intelligence, spirit, and stamina. With a distinctive head shape and high tail carriage, the Arabian is one of the most easily recognizable horse breeds in the world. The Arabian is good-natured, quick to learn, and willing to please. Arabian horses have refined, wedge-shaped heads, a broad forehead, large eyes, large nostrils, and small muzzles. Most display a distinctive concave or "dished" profile. Another breed characteristic is an arched neck with a large, well-set windpipe set on a refined, clean throatlatch. The breed standard for Arabian horses describes the Arabians as standing between 14.1 and 15.1 hands (140-155 cm) tall. The Arabian Horse Association recognizes purebred horses with the coat colors bay, gray, chestnut, black, and roan. Bay is the most common color, followed by gray, and then chestnut. Black is somewhat rare. Description: The Shetland pony is a breed of pony originating in the Shetland Islands. Shetlands range in size from a minimum height of approximately 28 inches to an official maximum height of 42 inches (10.2 hands, 107 cm) at the withers. (11.2 hands for American Shetlands) Shetland ponies have heavy coats, short legs and are considered quite intelligent. They are a very strong breed of pony, used for riding, driving, and pack purposes. Shetland Ponies are hardy and strong, in part because the breed developed in the harsh conditions of the Shetland Islands. In appearance, Shetlands have a small head, sometimes with a dished face, wide spaced eyes and small, alert ears. The original breed has a short, muscular neck, compact, stocky bodies, and short, strong legs and a shorter than normal cannon bone in relation to their size. A short broad back and deep girth are universal characteristics as is a springy stride. Shetlands have long thick manes and tails and a dense double winter coat to withstand harsh weather. Shetlands can be almost every color, including skewbald and piebald (called pinto in the United States), but are mainly black, chestnut, bay, brown, gray, palomino, dun, roan, cremello, and silver dapple. Shetland ponies are generally gentle, good-tempered, and very intelligent by nature. They make good children's ponies, but can be very opinionated or "cheeky," and, if not handled properly, can be impatient, snappy, and sometimes become uncooperative, traits often lumped under the label "stubborn" by those who fail to understand that pony behavior is influenced by the quality of human handling. Due in part to their intelligence and size, they are easily spoiled and can be very headstrong if not well-trained. 3. List four physical characteristics of the mule. Mules are almost always sterile. They are a cross between a male donkey and a female horse. The sterility is attributed to the different number of chromosomes the two species have: donkeys have 62 chromosomes, while horses have 64. Their offspring thus have 63 chromosomes which cannot evenly divide. Mules are generally considered to be more intelligent than either horses or donkeys. Its short thick head, long ears, thin limbs, small narrow hooves, short mane, absence of chestnuts (horny growths) inside the hocks, and tail hairless at the root, make the mule look like a donkey. Its height and body, shape of neck and croup, uniformity of coat, and teeth, make it look like a horse. The mule possesses the sobriety, patience, endurance and sure-footedness of the donkey, and the vigour, strength and courage of the horse. Their hooves are harder than horses, and they show a natural resistance to disease and insects. They are capable of striking out with any of their hooves in any direction. 4. Identify a burro from a picture or live. Give its size, color, and usefulness. The Spanish brought donkeys, called "burros" in Spanish, to North America, where they were prized for their hardiness in arid country and became the beast of burden of choice by early prospectors in the Southwest United States. In the western United States the word "burro" is often used interchangeably with the word "donkey" by English speakers. Sometimes the distinction is made with smaller donkeys, descended from Mexican stock, called "burros," while those descended from stock imported directly from Europe are called "donkeys." 5. Identify from pictures or live animals four kinds of milk cattle and four kinds of beef cattle. Description: Brown Swiss is the breed of dairy cattle that produces the second largest quantity of milk per annum. The milk contains on average 4% butterfat and 3.5% protein, making their milk excellent for production of cheese. The Brown Swiss is known for their immense size, large furry ears, and an extremely docile (though some would say lethargic) temperament. Description: The Guernsey is a breed of cattle used in dairy farming. It is cream and brown in color and is particularly renowned for the rich flavor of its milk, the very rich yellow color that is richest color of any milk breed, as well as its hardiness and docile disposition. Description: The primary color pattern for this dairy breed is black and white, but a red and white variety, called "Red Holstein", is also maintained. They are the most common breed of milk cow in America, gives the highest amount of milk yet the lowest butterfat. Description: The Jersey cow is quite small, ranging from only 800 to 1200 pounds (360 to 540 kg), but by some measures it produces more milk per unit of body weight than any other breed, and has the highest feed-to-milk conversion efficiency of any dairy breed. The milk is highest of all breeds for butterfat. Milk is known for the high cream and rich taste. Bulls are also small, ranging from 1200 to 1800 pounds (540 to 820 kg), and are notoriously aggressive. Description: Angus cattle are naturally polled (meaning they do not grow horns) and solid black, although white may appear on the udder. Black Angus are the most popular beef breed of cattle in the United States. Description: The Brahman has a distinct large hump over the top of the shoulder and neck, and a loose flap of skin (dewlap) hanging from the neck. Their ears are large and floppy. Bulls weigh 800 to 1100 kgs . Despite their huge size, they are known as a docile breed, if handled with kindness from calfhood. Description: This breed has been quite popular in the top end of Australia where they are more adaptable to the harsh weather conditions. The coat is almost pure white. Description: Hereford cattle are a widely-used breed in temperate areas, mainly for beef production. Originally from Herefordshire, England, they are the most common breed of beef cattle in the temperate parts of Australia. The breed also enjoys great popularity among ranchers in the desert American Southwest of the United States and also in the centre and east of Argentina. 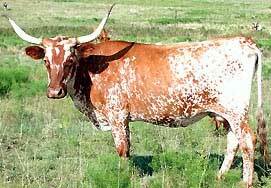 Description: The Texas longhorn is a breed of cattle known for its characteristic horns, which can extend to six feet in width and have a slight upward turn at their tips, as well as for their distinctive burnt orange coloring. 6. Know the milk-producing qualities of the Jersey, Guernsey, and Holstein breeds. Brown Bessie, the famous champion butter cow of the Chicago World's Fair dairy test, averaged over 40 pounds (18 kg) of milk a day for five months, and made 3 pounds (1.3 kg) of butter a day several times. Guernsey cows produce around 6000 liters per cow per year, or 16.4 liters (4.3 gallons) per day. Recorded cows in the USA produced 22,347 pounds (10,158 kg) of milk at 3.64% fat and 3.05% protein. 7. What is the difference between the Angora and milch goats? Give the distinguishing colors of at least three different breeds of goats, such as Saanen, Toggenburg, Nubian, and British Alpine. The word milch is German for milk, so one might correctly infer that the milch goat is one that has been bred for milk production. An angora goat is bred for wool production. Description: Saanen goats are a white breed of goat which are the largest of the dairy breeds. Does typically weigh 150 lb (68 kg) or more, with bucks weighing over 200 lb (91 kg). The Saanen breed also produces the most milk (as a breed- there will be good and poor individuals in any breed) and tends to have a lower butterfat content, about 2.5%-3%. The Saanen temperament is as a rule, calm and mild mannered; breeders have been know to refer to them as living marshmallows. Saanen goats are easier for children to handle and are popular in the showmanship classes due to their calm nature. With solid white coats and pink skin these extremely mild tempered goats are heavy milkers. They originated from Switzerland. Description: The Toggenburg is named after the region in Switzerland where the breed originated, the Toggenburg valley. Toggenburgs are medium in size, moderate in production, and have relatively low butterfat content (2-3%) in their milk. The color is solid varying from light fawn to dark chocolate with no preference for any shade. Distinct white markings are as follows: white ears with dark spot in middle; two white stripes down the face from above each eye to the muzzle; hind legs white from hocks to hooves; forelegs white from knees downward with a dark line (band) below knee acceptable; a white triangle on either side of the tail. Wattles, small rudimentary nubs of skin located on each side of the neck, are often present in this breed. The Toggenburg underwent a development program when introduced to Britain - the resulting British Toggenburg being heavier and having improved milk quality. By the middle of the year 2002, 4146 Toggenburgs had been registered with the New Zealand Dairy Goat Breeders Association, representing 8.10% of registered dairy goats. They perform better in cooler conditions. They are the oldest known dairy breed of goats. Description: The Anglo-Nubian, or simply Nubian in the United States, is a breed of domestic goat developed in Great Britain of native milking stock and goats from the Middle East and North Africa. Its distinguishing characteristics include large, pendulous ears and a "Roman" nose. Due to their Middle-Eastern heritage, Anglo-Nubians can live in very hot climates and have a longer breeding season than other dairy goats. Considered a dairy or dual-purpose breed, Anglo- Nubians are known for the high butterfat content of their milk, although on average, the breed produces less volume of milk than other dairy breeds. Anglo-Nubians are large, with does weighing around 64 kg. The average height of the breed, measured at the withers, is 81 cm for does and 94 cm for bucks. Like most dairy goats, they are normally kept hornless by disbudding within approximately two weeks of birth. Description: The Alpine is a large breed of dairy goat which may have a variety of coat colors. British Alpines are black with white markings. They are best suited to temperate climates and do not do well in humid environments. Alpines have erect ears, and multiple coat colors are acceptable. The Alpines are excellent milkers and can produce milk over an extended period of time. The Alpine is the second most registered of the dairy breeds. Average milk fat content for Alpines was 3.5 percent in 2003 and average milk production per doe was 2,083 pounds, according to national Dairy Herd Improvement statistics. 8. Identify from pictures or live sheep and note wool and meat production, size, markings, and general appearance of three breeds of sheep, such as Merino, Rambouillet, Shropshire, Hampshire, and Lincoln. Description: The merino is the most numerous breed of sheep in the world. It is a breed prized for its wool, although more recently the low price of wool has led to more of an emphasis on its meat. Super fine merinos are regarded as having the finest and softest wool of any sheep. Description: The Rambouillet is also known as the Rambouillet Merino or the French Merino. The fleece was valuable in the manufacture of cloth, at times being woven in a mixed fabric of cotton warp and wool weft, known as delaines. The breed is well known for its wool, but also for its meat, both lamb and mutton. It has been described as a dual-purpose breed, with superior wool and near-mutton breed characteristics. Description: The Shropshire breed of sheep originated from the hills of Shropshire, and North Staffordshire, England, during the 1840's. The breeders in the area used the local horned black-faced sheep and crossed them with a few breeds of white-faced sheep (Southdown, Cotswold , and Leicester). This produced a medium sized hornless sheep that produced good wool and meat. The breed's adaptability to most environments and their dual-purpose nature led to them quickly becoming a popular breed. Today's modern Shropshire isone of the most numerous breeds of sheep (especially in the mid-west). Its gentle nature and medium size makes it very popular with 4H exhibitors. The mature weights for Shropshire rams is between 225 to 250 pounds and between 150 to 180 pounds for the females. Description: The Hampshire is a breed of sheep developed from the Southdowns. The Southdowns had long had sheep which had dark brown or black legs, matured early, produced the best of mutton and a fine quality of medium wool. The original Hampshire was larger, coarser, but hardier, slower to mature, with inferior flesh, and a longer but coarser wool. The Southdown had always been remarkable for its power of transmitting its special characteristics to its progeny by other kinds of sheep, and hence it soon impressed its own characteristics on its progeny by the Hampshire. The horns of the original breed have disappeared; the face and legs have become dark, the frame has become more compact, the bones smaller, the back broader and straighter, the legs shorter, and the flesh and wool of better quality, while the superior hardiness and greater size, as well as the large head and Roman nose of the old breed, still remain. Hampshires of the 1890s matured early and fattened readily. They clipped from six to seven pounds of wool, suitable for combing, which was longer than Southdown wool, but less fine. The resultant mutton had a desirable proportion of fat and lean, and was juicy and fine flavored; the lambs were large and were usually dropped early and fed for market. Description: The Lincoln Longwool is a breed of sheep from England that has been significantly altered by selective breeding in the later part of the eighteenth century. Cross-breeding with Leicesters improved the breed's meat production qualities. The Lincoln Longwool is the largest British sheep, developed specifically to produce the heaviest, longest and most lustrous fleece of any breed in the world. Great numbers were exported to many countries to improve the size and wool quality of their native breeds. The versatile fleece is in great demand for spinning, weaving and many other crafts. The adult has a body weight of about 60 kg, its fleece can weigh up to 7 kg with a diameter of about 40 microns and a staple ranging up to 32".